This paper presents a novel ESPRIT algorithm-based joint angle and frequency estimation using multiple-delay output (MDJAFE). The algorithm can estimate the joint angles and frequencies, since the use of multiple output makes the estimation accuracy greatly improved when compared with a conventional algorithm. The useful behavior of the proposed algorithm is verified by simulations. Antenna array has been used in many fields such as radar, sonar, electron reconnaissance and seismic data processing. The direction-of-arrival- (DOA-) estimation of signals impinging on an array of sensors is a fundamental problem in array processing [1–5]. Angle estimation and frequency estimation [6, 7] are two key problems in the signal processing field. The problem of joint DOA and frequency estimation arises in the applications of radar, wireless communications and electron reconnaissance. For example, these parameters can be applied to locate the radars and to locate pilot tones in electron reconnaissance systems . Furthermore, a precise estimation of these parameters is helpful to attain a better pulse descriptor word (PDW) and thus enhances the system performance. Optimal techniques based on maximum likelihood  are often applicable but might be computationally prohibitive. Some ESPRIT-based joint angle and frequency estimation methods have been proposed in [10–14]. Zoltowski and Mathew  discuss this problem in the context of radar applications. Pro-ESPRIT is proposed to estimate angle and frequency. Haardt and Nossek  discuss the problem in the context of mobile communications for space division multiple access applications. Their method is based on Unitary-ESPRIT, which involves a certain transformation of the data to real valued matrices. Multi resolution ESPRIT is used for joint angle frequency estimation in . ESPRIT method is used for frequency and angle estimation under uniform circular array in [13, 14]. 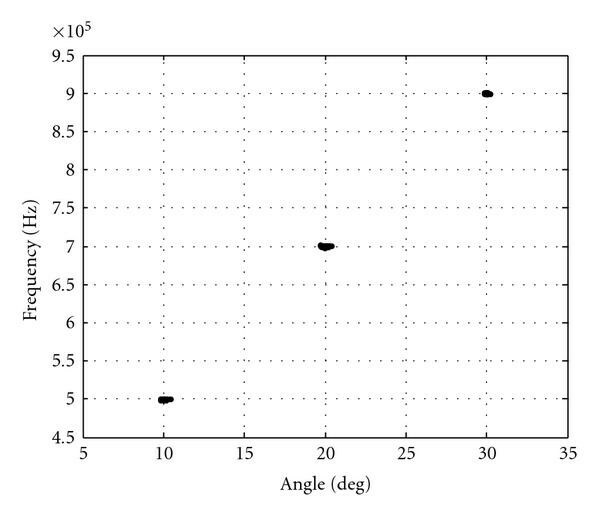 References [15, 16] proposed the trilinear decomposition method for joint angle and frequency estimation method. The other joint angle and frequency estimation method is proposed in [17–24]. This paper uses multiple-delay output, so as to achieve the purpose of improving estimation accuracy. This algorithm has the improved performance compared with conventional method. The proposed algorithm is applicable to uniform linear array. We denote by the matrix transpose, and by the matrix conjugate transpose. The notation refers to the Moore-Penrose inverse (pseudoinverse). where is direction of arrival (DOA) of the th signal, and is array spacing. is the narrow-band signal of the th source. In order to estimate frequency, we add delayed outputs for the received signal of array antenna, as shown in Figure 1. We suppose that . The received signal with delayed output. where is a full-rank matrix. Let , so . Because has the same eigenvalues as , we use eigenvalue decomposition on to get , and then estimate frequency , . Using eigenvalue decomposition of , we can get the eigenvalues , . where angle denotes taking the phase angles. Let , so . Because has the same eigenvalues as , we use eigenvalue decomposition on to get , . And then estimate , . Using eigenvalue decomposition of , we can get the eigenvalues , . In contrast to ESPRIT algorithm , this algorithm has a high computational load, which is usually dominated by formation of the covariance matrix, matrix inversion and calculation of EVD. The major computational complexity of this algorithm is , while ESPRIT requires , where , , , and are the number of antennas, delays, snapshots, and sources. We present Monte Carlo simulations that are used to assess the angle and frequency estimation performance of MDJAFE algorithm. The number of Monte Carlo trials is 1000. Note that is the number of antennas; is the number of the delays; is the number of snapshots; is the number of the sources. Define , where is the estimated angle/frequency, and is the perfect angle/ frequency. The performance of this proposed algorithm is investigated. , , , and in this simulation. Their DOAs are 10°, 20° and 30°), and their carrier frequencies are 500 kHZ, 700 kHZ and 900 kHZ. Figure 2 shows the performance of this proposed algorithm with dB, 30 dB. From Figures 2 and 3 we find that this proposed algorithm works well. 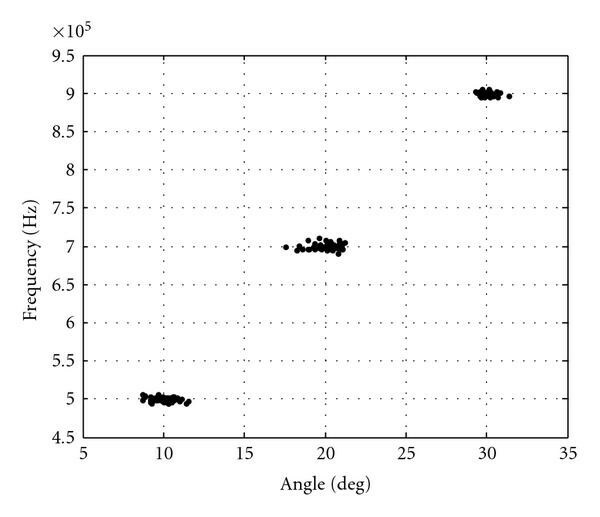 Angle-frequency scatter, SNR = 15 dB. We compare this proposed algorithm with conventional method  which is without delay. , , , and in this simulation. From Figure 4 we find that this proposed algorithm has better angle-frequency estimation performance than conventional method. MDJAFE algorithm performance under different snapshots is investigated in this simulation. , , and in this simulation. Figure 5 shows the angle-frequency estimation performance under different . We find that the angle-frequency estimation performance of MDJAFE algorithm is improved with increasing. Angle-frequency estimation with different snapshot N.
The performance of this algorithm under different source number is investigated in the simulation. , , and in this simulation. The source number is set to 2, 3, and 4. MDJAFE algorithm has different performance under different source numbers, as shown in Figure 6. From Figure 6, we find that angle and frequency estimation performance of MDJAFE algorithm degrades with the increase of the source number . Angle-frequency estimation with different sources. The performance of this algorithm under different antenna number is investigated in the simulation. , , and in this simulation. The antenna number is set to 8, 12, and 16. MDJAFE algorithm has different performance under different antenna number, as shown in Figure 7. From Figure 7, we find that angle and frequency estimation performance of MDJAFE algorithm is improved with increasing. Angle-frequency estimation with different antennas. The performance of this algorithm under different delay number is investigated in the simulation. , , and in this simulation. The delay number is set to 1, 2, 3, and 4. MDJAFE algorithm has different performance under different delay numbers, as shown in Figure 8. From Figure 8, we find that angle and frequency estimation performance of MDJAFE algorithm is improved with increasing. Angle-frequency estimation with different delay number. This work presents a new ESPRIT algorithm-based joint angle and frequency estimation using multiple-delay output. The advantage of this proposed algorithm using the multiple-delay output over the conventional algorithm is that the estimation accuracy has been greatly improved. This paper is supported by China NSF Grant (60801052), Aeronautical Science Foundation of China (2009ZC52036), Ph.D. Programs Foundation of China's Ministry of Education (200802871056) and Nanjing University of Aeronautics and Astronautics Research Funding (NS2010109, NS2010114). The authors thank Professor Zhang Xiaofei for his help.